Sometimes a little nagging is a good thing. 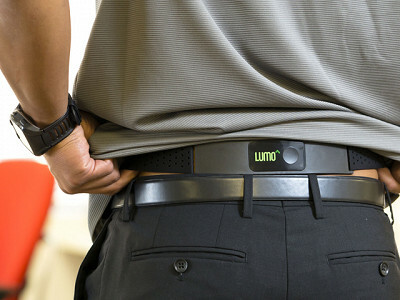 The LUMOback sensor sits on your waist and vibrates when you slouch, gently reminding you to correct your posture. It continually measures the spinal position of your lower back and provides immediate feedback to help you get into the habit of sitting straighter and standing taller. Conceived by Monisha Perkash, Charles Wang and Andrew Chang, LUMOback tracks your movements wirelessly and sends data to an iPhone, iPod touch, or iPad device. The small, flexible sensor works in conjunction with the LUMOback app, which keeps track of your progress and activity levels over time. The app has an avatar component that mirrors your posture, so it’s easy to get a visual sense of how you’re sitting, standing, walking and sleeping. The idea for LUMOback started with Andrew, who was plagued by a bad back and wound up taking classes that taught him how to sit, stand, and sleep properly. Andrew’s efforts to learn better posture inspired the trio of Stanford graduates to create LUMOback using the latest sensor and mobile technologies. It’s an easy, automated way to bring a posture coach into your everyday life and help you learn to straighten up. Hello everyone! I’m Monisha, one of the co-founders of LUMO BodyTech. I’m so glad to be here on The Grommet and to welcome you to a revolution. This revolution is one where sitting well, avoiding sedentary behavior, and minding our posture is as normal as brushing our teeth. In the process, we not only feel better, but we look better too! At LUMO, we believe that you can't improve what you don't measure, and therefore our products give you quantifiable data to achieve quantifiable results. Today we’re focused on posture; tomorrow, we’ll extend our technology to help consumers self-track additional attributes to improve their overall health and fitness. This is a very exciting time for all of us because, through technologies like LUMOback, we can give our bodies a voice. I'm thrilled that you've joined us on our journey – I welcome your feedback and am available to answer any questions you may have! Post this again when you have an android app! Too many apples make you constipated! @Joe We're working on it! I would buy this in a heartbeat if you had an Android/GooglePlay app. @MaryBeth We're working on it! Do you have anything like this to help with the upper back posture issues? I'm thinking something to remind a person to pull their shoulder blades back & down, keeping the shoulder square? @maureen We don't currently have something to target upper back specifically. LUMOback is highly sensitive at measuring lower back spinal posture. In most cases, poor lower back posture leads to poor neck and upper back posture. By correcting the lower back, LUMOback will help correct many cases of poor neck and upper back posture. However, there are cases in which poor neck and upper back posture occur in isolation without abnormal lower back posture. In those cases, LUMOback does not currently detect the isolated neck and upper back slouching. "Post removed to comply with our message board policies." Add me to the list when the Android version is available! Sometimes a little nagging is a good thing. 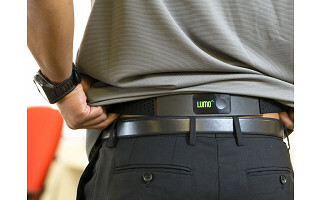 The LUMOback sensor sits on your waist and vibrates when you slouch, gently reminding you to correct your posture. It continually measures the spinal position of your lower back and provides immediate feedback to help you get into the habit of sitting straighter and standing taller. Conceived by Monisha Perkash, Charles Wang and Andrew Chang, LUMOback tracks your movements wirelessly and sends data to an iPhone, iPod touch, or iPad device. The small, flexible sensor works in conjunction with the LUMOback app, which keeps track of your progress and activity levels over time. The app has an avatar component that mirrors your posture, so it’s easy to get a visual sense of how you’re sitting, standing, walking and sleeping.